Sometimes you may need to backup your important files and folders, Cool Burning Studio makes it convenient by creating high-quality data CDs or DVDs. 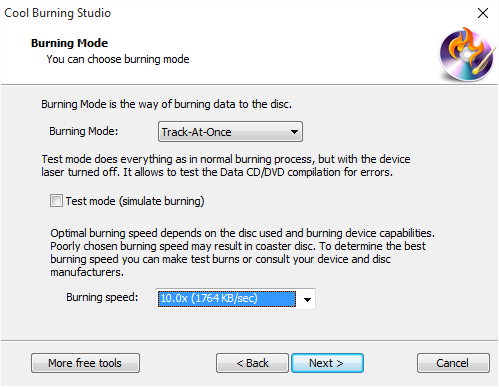 In this tutorial we’ll show you How to Burn Data CD / DVD with our disc burner software. Launch Cool Burning Studio. Insert a blank CD/DVD to the disc drive and click the “Data CD/DVD” to run the burner wizard. The burner scans your system for the available devices. Choose one of the usable burning drives from the list (the system will select it by default if there is only one). Click “Refresh” to update the device list if you plug in new devices or change the disc in the drive. Choose a file system type to store the data. 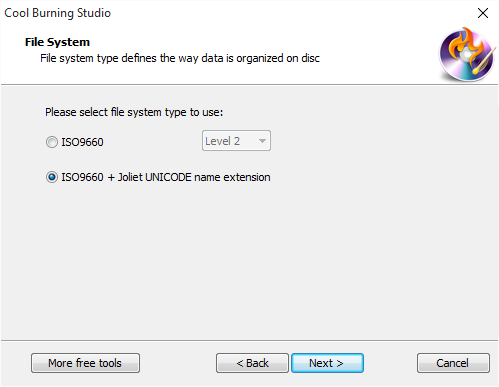 You can select one from ISO-9660 and ISO-9660 + Joliet UNICODE name extension. You may check the“Create bootable disc” and click the square button to find and open the boot image files to create bootable disc. Click “Add File(s)…” & “Add Dir…” to add data files & folders you want to burn and use “New Dir…” or “Rename Dir…” to create or rename the folder. Also, you can click “Remove” or “Remove All” button to remove one or all files & folders. Select one burning mode from “Burning Mode” drop-down list. You may choose test mode to simulate burning for checking errors. Then, choose the appropriate burning speed (Burning speed depends on the capabilities of your system and your drive). Click “Next” to start burning. The disc will eject after the data CD/DVD has been completely burned.